The exotic and tropical ylang ylang tree makes an unusual landscape accent with its long, drooping branches and supremely fragrant blossoms. 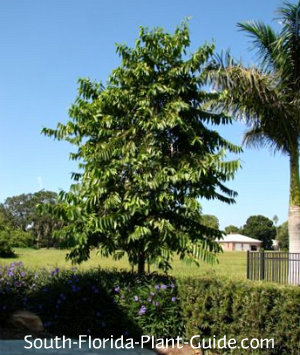 A fast grower, the ylang ylang (pronounced "lang lang") can grow very large - as tall as 60 feet or more - but a tree of this size is rarely seen in South Florida. Young trees have a Christmas tree appeal with their outstretched branches. These trees will begin blooming around 3 or 4 years old. The flowers aren't especially showy, since they emerge pale green - almost the same color as the leaves. As they mature, the blossoms turn chartreuse, and take on a darker yellow hue just before falling off. But their heavenly aroma makes the flowers of these fragrant trees extra special, since they're reputed to be a key ingredient in Chanel No. 5 perfume. Legend has it that Coco Chanel asked perfume-maker Ernest Bo to create the ideal scent for a woman's perfume. In 1921, he gave her a series of samples to try. She chose the 5th, made up of sweet essences of rose, jasmine and ylang ylang flowers. This is a somewhat delicate tree. Because it grows so quickly, the wood isn't dense and the long branches can break easily in a strong wind. A ylang ylang tree is tropical by nature, so it's best to place it in an area where other trees create a windbreak. As it matures, this tree should be professionally pruned for size to keep them 20 to 25 feet (or less). A fast grower with a conical shape, the ylang ylang likes full to partial sun. It's evergreen and blooms on and off during warm months of the year...the fragrance may give it away since the green flowers are next to invisible when they first appear. The ylang ylang is best in Zone 10B and frost-free areas of Zone 10A. It should be planted in an area protected from winter winds. If your yard gets frost on occasion, cover the tree - or don't plant one at all. 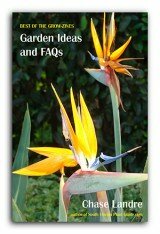 Add top soil or organic peat humus in the hole when you plant. You may want to add in composted cow manure as well to enrich the soil around the tree's roots. Trim as needed for size and shape, and to remove any too low branches - or unsightly ones that have been damaged by cold or wind. Once the tree reaches a size that's difficult for a homeowner to reach, we recommend using a professional arborist who is familiar with this species of tree to keep its height in check. 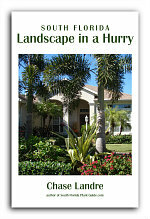 Water regularly and fertilize 3 times a year - in spring, summer and fall - with a good granular fertilizer. Because it doesn't grow a wide canopy, you can plant as close as 8 feet from the house. Come away from walks and drives 6 to 8 feet. With the intoxicating scent (said to be noticeable from 30 feet away), you should only plant one of these...more than one may be too much for the senses. 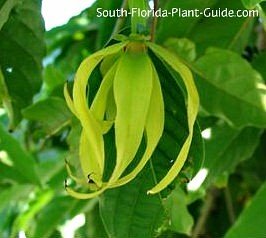 Ylang ylangs will grow in large containers while young. COMPANION PLANT SUGGESTIONS: Plant with windbreak trees nearby, such as live oak, Arizona cypress, and southern red cedar. 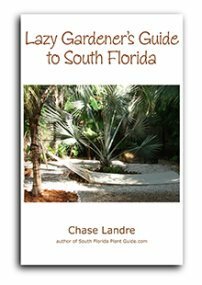 If lower branches are left on the tree, use groundcovers such as Asiatic jasmine (jasmine minima), coral creeper, or sunshine mimosa.